I love shopping at the discount retailers for clothes for my little girl. She grows out of clothes so quickly that it seems pointless spending a small fortune on new items for her when, in a month’s time, she’s no longer going to fit into them. Some of my favourite stores to pick up clothing for her are George at Asda, Matalan and F&F at Tesco as the prices are amazing and I’ve never had any issues with the quality of the products. As we’re now well into Autumn and Winter’s on it’s way there’s an array of gorgeous pieces for the little ones so here’s what’s on my wish list for my little one. Notice: I have removed the links to the products that are no longer available. This 3 in 1 outfit looks lovely with it’s matching gilet. 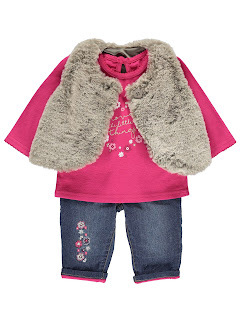 My little one has never worn jeans or a gilet, so I think she’d look extra adorable in this outfit and it looks so snug. This coat is so adorable and looks so cosy and warm. I love the matching mittens and the off-centre buttons makes this look extra special. In fact, I’m jealous that they don’t do an adult version! 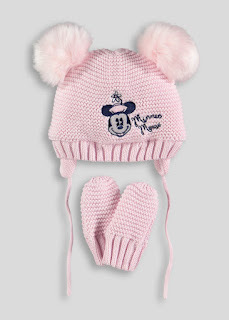 This hat and mittens set is my favourite item on my wish list. 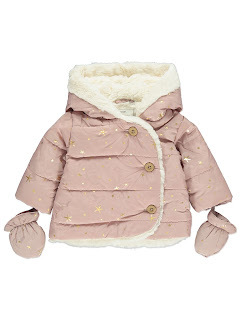 It’s so cute and will be perfect for my baby girl’s first Winter. Just look at those little fluffy ears! 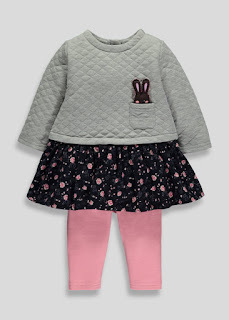 This dress and leggings set is made extra special with the peeking bunny and printed hem. I love the combination of colours on this outfit and think it would be the perfect outfit to wear to visit the grandparents this Autumn/Winter. My baby girl usually wears sleepsuits and a sleeping bag to bed but I’ve been thinking about changing her into pyjamas as sometimes the sleepsuits seem a bit snug around her nappy (even in a bigger size), and I think these Little Miss Giggles ones are perfect and what a pretty design! 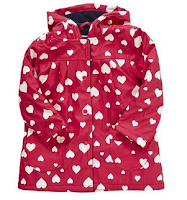 I’ve just bought myself an almost identical raincoat from George (except mine’s blue), so this raincoat is perfect for my mini-me. It would be perfect for those rainy days and it the design is so pretty. 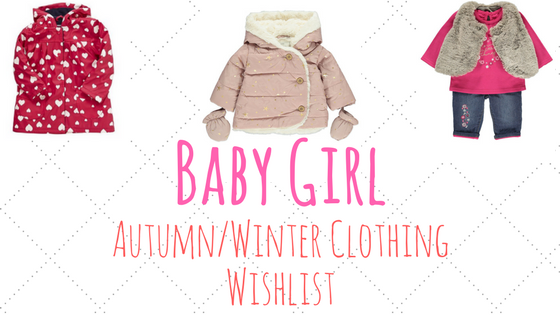 What’s on your baby’s clothing wishlist this Autumn/Winter? Let me know in the comments section below. I love the bunny dress and leggings set! So cute!